Have you thought about offering telehealth sessions at your private practice? Given the rising popularity of telehealth in all areas of medicine, the answer is likely yes. In this guide, we’ll not only provide you the background you need to understand telehealth’s growing demand, but we’ll also dive into what you need to know so you can start offering online therapy options in your own private practice. The World Health Organization (WHO) defines Telehealth as health care services that use telecommunications and virtual technology to deliver health care outside of traditional health-care facilities. These technologies include videoconferencing, the internet, store-and-forward imaging, streaming media, and terrestrial and wireless communications. Telehealth is different from telemedicine because it encompasses a broader scope of remote healthcare services. According to the ONC. telemedicine refers only to remote clinical services, while telehealth can refer to a range of non-clinical healthcare services as well. Flexible schedule: With telehealth you can have secure, real-time two-way communication with your clients anytime and anywhere. You can conduct sessions during times that best fit your schedule (and your clients). You do not have to be confined to a 9-to-5 schedule if it does not fit your lifestyle. Convenience: You can provide your services from your office, your home, or even while traveling. With telehealth you are no longer constrained by your physical location, you can easily connect with your clients as long as you have an internet connection and a camera. Greater access: Telehealth can make mental health services more accessible and convenient—increasing mental health treatment outcomes. Clients may also seek care earlier if they have the option to get help without leaving their homes as this allows them to avoid the perceived social stigma associated with mental health care. Additionally, telehealth also gives rural patients and patients with limited mobility increased access to healthcare they may not have had access to otherwise. Increased income: Telehealth gives you the opportunity to offer additional hours in which you may be available. With telehealth you can schedule appointments at non-traditional hours, which not only allows you to increase your revenue by opening access to more potential clients. It also removes the barriers many clients may face in seeing a therapist (i.e. not being able to take off time from work, office being too far away, not having access to transportation). Additionally, because clients can take appointments anywhere, you’re likely to see fewer no shows. Improved quality: Countless studies over the last decade have consistently shown that telehealth provides quality of care that is on par with traditional in-person services. In the mental health field, in specific, studies have shown telehealth can provide outcomes that are greater than in person services and have better patient satisfaction. Telehealth is a rapidly expanding area both inside the mental health space and outside of it. Telehealth’s growing popularity can be attributed to the fundamental benefits it brings to both providers and clients. Our list above just includes a few of these many benefits. However, to gain a better picture of what telehealth has to offer, let’s break down some numbers and studies. How does telehealth impact individuals everyday? There is growing awareness and support for mental health conditions, however, one in every five US adults is diagnosed with a mental health disorder every year. Additionally, another 56% of Americans who have a mental health condition do not get adequate treatment. Though there are many reasons that impact if someone receives proper treatment, one very important factor in this statistic is access to care. As of December 2017, there are 5,042 designated mental health shortage areas across the United States, leaving over 120 million people without access to proper mental health services. This is where telehealth comes into play. Telehealth is an important (although not the only) step in correcting this statistic and offering care to those who need it most. Studies have consistently shown the positive benefits virtual mental health services can have on individuals. A study comparing telepsychiatry to in person consultation found that 96% of telepsychiatry patients were satisfied with their online sessions. In addition, telepsychiatry clients showed significant improvement on a pre and post sessions mental health screening researchers administered, while in- person clients showed no significant change after their sessions. Another large scale study done by Johns Hopkins consisting of 98,609 participants found that individuals who were enrolled in the VA’s telemental health services were less likely to be hospitalized for mental health conditions. Telehealth patients saw a 26.6% decrease in the number of hospital admissions and days of acute hospitalization from 2006-2010. Telehealth’s benefits aren’t only restricted to clients, they extend providers as well. When a board-certified psychiatrist chose to use telemedicine technology inside her practice for the comfort, convenience and personalized care it provided to her patients, she was able to extend her care by more than 550 visits and increased her practice’s earnings by $48,000 along the way. These statistics help us get a more grounded view of the real world benefits telehealth has to offer our communities. Telehealth regulation is a tricky subject. Every state has different policies and regulations in place to manage virtual medical services, which, unfortunately means there is no blanket information we can provide that would be true in every situation. However, to make it easier for you to understand what telehealth regulations look like in your state, we’ve compiled a list of resources you can use to easily find what you need to know. Remember to always consult state and federal laws prior to providing any services to a client via an online platform. This is especially relevant if you work with minors as some states have different and more strict regulations for these services. eVisit State Telemedicine Legislation – A clickable, virtual map that provides an indepth look at state legislation in easy to understand language. American Telemed’s State Policy Resource Center and State Toolkits – A detailed reporting of all proposed and ratified telehealth regulations and policies on a state by state basis. Policies are tracked in real time so you will always have the most up to date information. CCHPCA State Laws and Reimbursement Policies and their State Telehealth Laws and Reimbursement Policies PDF (April 2017) – This resource also you to stay up to date on all Telehealth laws, policies, regulations, and Medicare/Medicaid programs state by state. Additionally, it also has a section for pending laws and regulations. You also can print a PDF that can be easily shared with staff in your practice. An important consideration to remember is that you need to look at state policy for both the state where you will be offering services from and the state your client will be in at the time of the service. Practicing medicine (which includes telehealth) requires a certificate of licensure from the state in which you, the provider, is working and may also require licensure in the state where your client is located. As the provider, it is your responsibility to confirm whether you have the right to provide services. Check out this State Interstate Licensure Matrix to see what State Licensure Compact Legislation your state supports or is considering. Once you’ve understood the legislation that regulates telehealth in your state, getting started is easy in comparison. In this section we’ll breakdown what you need to know before you can start offering telehealth sessions in your private practice. The most important thing you need to have when you start offering online therapy is a HIPAA compliant video conferencing system. Skype and FaceTime are not suitable options. 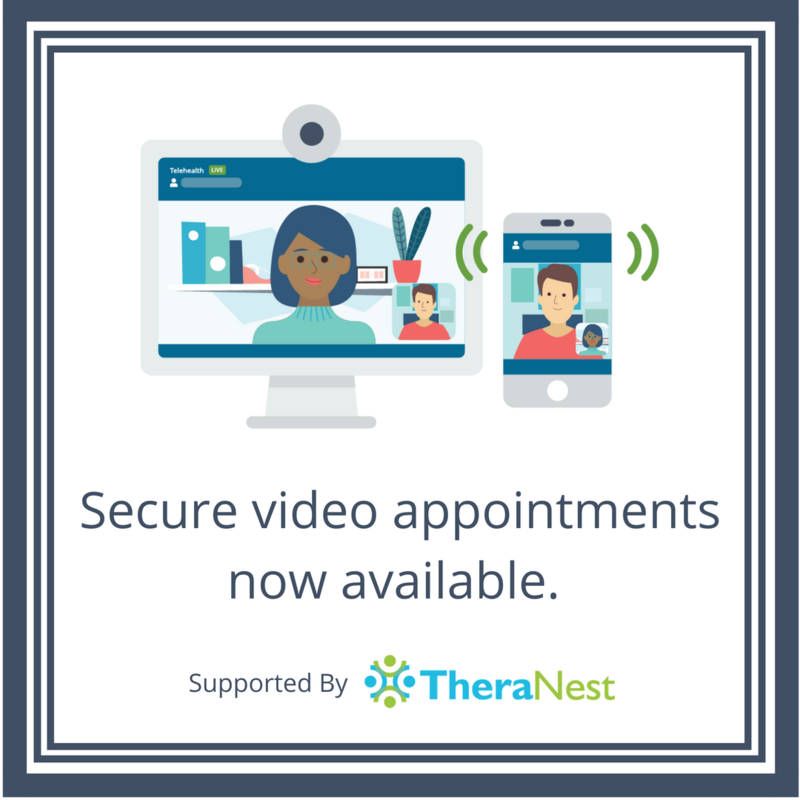 Instead check out TheraNest’s Telehealth feature which offers secure, HIPAA compliant video sessions between you and your client. This feature is fully integrated with TheraNest’s practice management features and there is no need for your clients to download any additional applications to join their session. We also recommend installing all needed updates on your computer and using an updated browser, such as Google Chrome or Apple Safari, to conduct your sessions. Additionally, you need to ensure you have access to a high speed internet connection. Use Google’s speed test to test the quality of your internet. If either your download or upload speed is below 3 Mbps, you should consider upgrading your internet connection. Additionally, before your session, close all other browsers and applications to ensure a better connection. Although Wifi is compatible with most telehealth platforms, when possible we recommend using a wired Ethernet connection instead of using Wifi. Wired internet provides a better connection that is more stable. If your computer does not have an ethernet port, you can purchase this ethernet adapter to switch to a wired connection. Privacy: Select a space for your online therapy sessions that is private and free of distractions. You want to make sure that no one else can hear the conversation between you and your client. Noise Level: Ensure that there are no noises that could be distracting to you or the client during your session. This includes doorbells, noises from outside, TVs, radios, and other conversations. Visual Distractions: Your background in the camera should be free of all clutter. We recommend having a neutral colored wall so it does not distract your client. Lighting: Try to maintain a consistent light source throughout your online therapy session. Avoid having light sources behind you as this can cause your face to be shadowed. Make sure your face is fully lit and in the frame during your session. We recommend placing lights around the room or ensuring you have good natural light in your space. Try to keep windows and curtains closed if they are behind you, both to ensure you have consistent lighting and also to protect the privacy of your clients. Check out this lighting guide for more details. Clothing: Even though you may not be leaving your home, dressing professionally during your telehealth sessions is important. Wear clothing that is in contrast with your background, but try to avoid patterns because they can be visually distracting and cause eye strain for your clients. Eye contact: Maintaining eye contact during your online sessions is imperative. You want your client to feel as if they have your full attention. Avoid doing other work, looking at other screens, or taking notes for long periods of time. It can be distracting, and even unnerving, for your clients if they see you constantly looking away. Be mindful of your eye contact and explain to your clients why you are looking away when it is necessary. After preparing your space for your telehealth sessions, it is important to prepare both yourself and your clients for the upcoming appointment. Prepare yourself: Test out your telehealth platform before your first appointment. Send a practice link to a friend and ask them to hop on quickly so you know what the process looks like. This also allows you to make sure all of your equipment is working properly and let’s you catch any problems before your real appointment. Prepare your client: Inform your client about what they should expect during their telehealth session. Let them know what platform you will be using to conduct your sessions and inform them ahead of time if they need to download any additional applications (with TheraNest they won’t need to download anything). Share this easily digestible infographic with your clients. 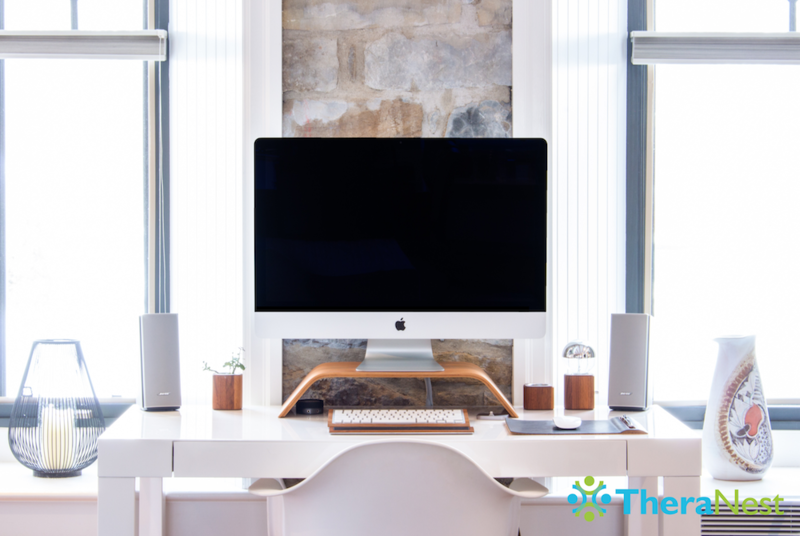 It presents all of the information they need to know about getting setup for their first online therapy appointment in an easy to understand format (this is also a great resource for you and your office). 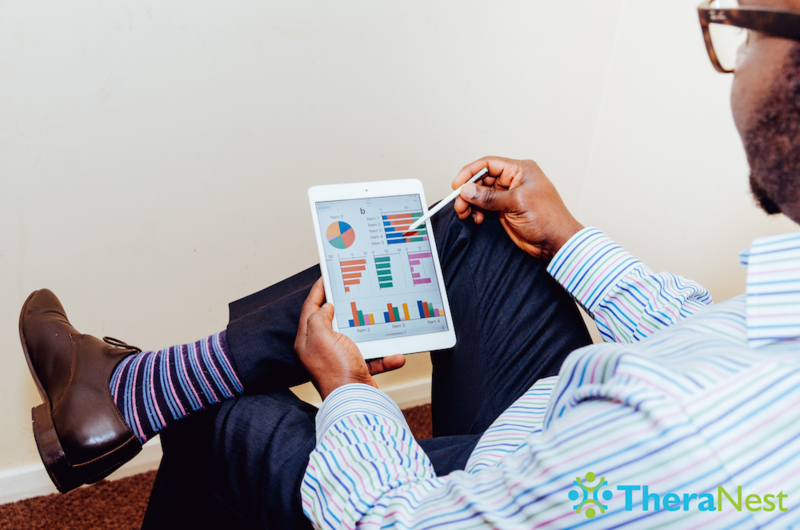 Check out this FAQ that you can also share with your clients if you’re offering telehealth services via TheraNest. It walks them through the process of joining a call and answers some of the more frequent questions clients may have regarding telehealth. Consent documents: Whether you need to provide your clients with consent documentation or not depends on your state regulations. Some states do not require any consent documentation, while others require verbal or written consent. Find your state’s You can check your state’s requirements on CCHPCA here. Click your state on their interactive map and scroll down to Consent. Emergency services: Since you are providing care from a distance, it is important for both you and your client to know where they can access emergency services near them. You should know this information for every virtual client you see and you should include it in their charts. Telehealth billing and reimbursement, much like all medical billing, is a confusing topic. Constantly changing state regulations make it difficult to stay up to date on new policies. The good news is that many states now have parity laws which require private insurance payers to reimburse telemedicine visits the same way as in-person visits. Even after reading up on state reimbursement policies, you should always check with the payer before submitting claims. Insurance companies have their own specific requirements when it comes to accepting telehealth claims. For example, Medicare only reimburses for the time spent while the video is streaming. Knowing payer specific policy helps ensure you get paid in a timely manner for the services you provide. You are ready to start offering telehealth sessions, but how do you get remote clients? Once you make the decision to start telehealth, you have to also advertise your services. Your clients won’t know they can see you via video-conferencing unless you let then know this service is now available. Promote your new telehealth service via your website, newsletter, on all printed practice materials, and on your social media pages. Simply adding a line such as “Now available for video sessions.” can go a long way in getting you new telehealth clients. Ask current clients if they are interested in trying out telehealth. A great time to make this ask is if clients call to cancel or rebook appointments, you can propose telehealth as an alternative option during the call. Put up signs in your office regarding this new feature and inform clients at the end of their sessions that you now offer a telehealth option as well. Offering telehealth also serves as a way to differentiate yourself from other therapists, which can help you attract even more clients to your private practice. When advertising make sure to touch on the convenience and benefits telehealth can offer clients. Check out this Telehealth blog post to learn more ways in which you can advertise your new telehealth services. We’ve also created marketing material that you can use to advertise your Telehealth services offered through TheraNest. Check out our Marketing Your Telehealth Services blog post to gain access to Telehealth images you can share on your website, via email, and through your social media accounts. Telehealth is a powerful tool that offers many benefits to both therapists and clients. 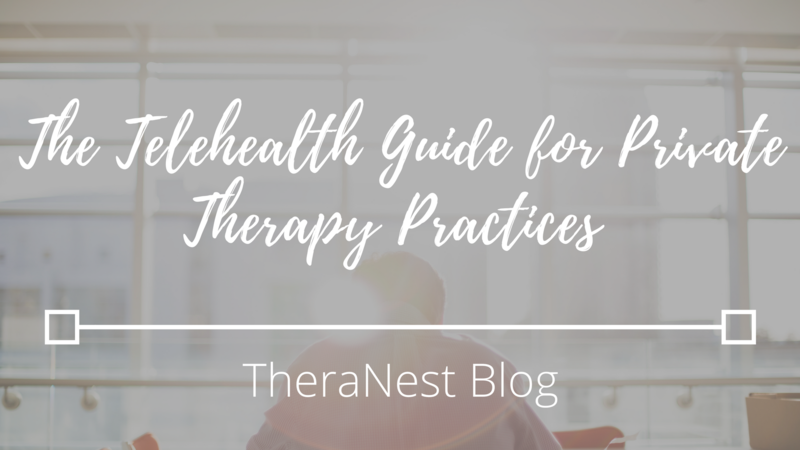 Though it may be easy to get caught up in the current momentum behind online therapy, it is important to ensure you do what is best for both you and your clients. Telehealth may not be the best fit for every client. Some clients may have specific needs that make them better fits for in-person treatment verses virtual sessions. As a provider, you should have processes in place to safeguard clients’ best interests. Similarly, if you do not feel comfortable providing online therapy services, remember that it is not a must do for every practice. Clients interested in traditional in person therapy will always exist. Providing quality care that you are confident in is the most important part of being a therapist. Telehealth is a rapidly growing field and this guide serves as a crash course in everything you need to know to get started. If you are interested in offering Telehealth services and you do not know which platform to use, check out TheraNest.TheraNest offers secure, HIPAA compliant video conferencing with a robust feature set, including screensharing and integrated billing, at a low monthly cost. Godleski, Linda, Adam Darkins, and John Peters. “Outcomes of 98,609 US Department of Veterans Affairs patients enrolled in telemental health services, 2006–2010.” Psychiatric services 63.4 (2012): 383-385.